When a trait is dominant, only one allele is required for the trait to be observed. A dominant allele will mask a recessive allele, if present. A dominant allele is denoted by a capital letter (A versus a). Since each parent provides one allele, the possible combinations are: AA, Aa, and aa. Offspring whose genotype is either AA or Aa will have the dominant trait expressed phenotypically, while aa individuals express the recessive trait. One example of a dominantly inherited trait is the presence of a widow’s peak (a V-shape) at the hairline. 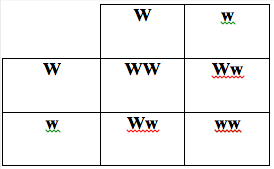 Let (W) represent the dominant allele, and (w) represent the recessive allele. An individual with a (WW) or (Ww) genotype will have a V-shaped peak at the hairline. Only ww individuals will have a straight hairline. To determine the probability of inheritance of a widow’s peak (or any other dominant trait), the genotypes of the parents must be considered. For example, if one parent is homozygous dominant (WW) and the other is homozygous recessive (ww), then all their offspring will be heterozygous (Ww) and possess a widow’s peak. If both parents are heterozygous (Ww), there is a 75% chance that any one of their offspring will have a widow’s peak (see figure). A Punnett square can be used to determine all possible genotypic combinations in the parents. A pedigree that depicts a dominantly inherited trait has a few key distinctions. Every affected individual must have an affected parent. Dominantly inherited traits do not skip generations. Lastly, males and females are equally likely to receive a dominant allele and express the trait. In this pedigree both heterozygous and homozygous individuals are affected since the trait is dominant.